New Graphics For ME Bloggers! 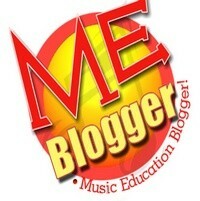 Become A Music Education Blogger Today! I’ve finished up a couple of graphics and badges that can be used for any ME Blogger! I’m pretty excited about them and I think they turned out pretty well (pat, pat!). :). I’m going to create a couple different ones in the time to come as well. You keep the badge the same as I have them, with the exception that you may re-size them to any size you would like and you may change the transparent color if need be. You can use this logo on any literature/paper/materials that you want, so long as you are a ME blogger! Right-Click the above and SAVE AS…. Please remember that to be an official ME blogger, not only do you need to blog about Music Education you need to join in the conversation with others by listing sites like mustech.net and others in your blogroll and commenting on other music educators sites every so often! Visit my blogroll in the left sidebar for an example, and some great bloggers! I will be posting the list of old and NEW ME bloggers very soon!!! Stay tuned!